I am waking up everyday so excited for our new adventure. It is getting more and more real! I packed up most of the shipment that will be staying in Turkey (at the summer house) as well as the stuff that will be shipped to the US. We are going to be staying with some friends in Dallas for a while which will give us time to get phones, buy a car, maybe even get Texas drivers licenses. I have to get fingerprinted for my new school as well. We will get all the bureaucratic things done in Dallas, and then we will go on vacation in Austin with our friends. They were the friends we toured Texas with in 2012, and they came to visit us in Turkey last year. I apparently have been very lax on the blogging as I did not blog about the epic international fun. Anyway, we are incredibly excited to be moving close to our friends, Shawn was Bulent’s landlord when he was a grad student in Texas in the early 2000s. Their bromance has lasted and deepened over the years. I met Shawn’s wife Larinda in 2012, two years after she made and sent (to Turkey) the most beautiful shadow box with our wedding invitation and wedding photo. I was so glad we hit it off, and so excited that we will be closer in distance! Whee! 27 days and counting to the move! The weekend after the first week of school I had to move. I didn’t schedule it, a change in corporate housing mandated the move. While I was trying to cement my classroom management and learn 200 students names, I was also making lists of what to pack each night. The move was quite daunting as we could not get the key to the apartment before we moved, and we had never seen it in person. The apartment turned out to very nice. Farther out than I would like, compared to my last easy to get around neighborhood, but has the benefits of the boondocks. The air is cleaner, we will not have issues with coal smoke here during the winter, there are no traffic problems, and we have a great view of undeveloped Anatolian hills. However, while the apartment is beautiful, it is a new building and there are some issues. Last night, after the 7th visit from a plumber in two weeks, the toilet FIANALLY stopped leaking onto the floor YAY! They also turned the heat on last night, which is great because it was REALLY cold. But now we have to turn it off because it is leaking. However, to put it in perspective, my friend just found out that internet is UN-INSTALLABLE in her apartment. The pipes that lead into her apartment to allow the fiber optic to be snaked in was crushed and so there is no way to bring in the cable. Packing was horrendous. I just hated it. It feels like I just did it. I did help my mother move our home last year. It was a lot of work. Even though out house is smaller, it still was a lot of work. Unpacking is a little better. Though at one point I got so visibly overwhelmed by the amount of work ahead, Bulent broke down all the boxes we had unpacked and removed them from the apartment. It helped significantly. Actually he turned Defcon 1 to something more like mild craziness. A miracle worker. As of now, we are mostly all set. There are some paintings I have been unable to hang because the walls are made of concrete. But that is just a challenge. It is coming! UPDATE: I just served coffee to a few men in my house. They have been working for over an hour on the heating. Things are looking up. UPDATE 2: The man, who says that my eyes are like those of the people he met in Kosovo when he was a soldier in NATO, fixed my heaters and bleed out the air from the system. We have had some awesome luck lately when it comes to shows. We took Bülent’s parents to an interactive show called “Dövüs Gecesi” or “Fight Night”. It was an interactive political piece to get people thinking about why people vote for their chosen candidates. It was very illuminating. At the end, one of the most charismatic candidates called for a change to the system and for people to not vote, to abstain from voting. In the US it is called apathy, in Turkey it is ILLEGAL to not vote. It was a call to conscious progress. The show was fun and interesting and a political call for change. A great show! The second show we went to recently was the Ankara Jazz festival. We went to see Karsu, ethnically Turkish, raised in the Netherlands, named after her father’s village in Hatay. Bülent has been following her for a while, and really loves her music, so when he found out she was coming to Ankara, he could not wait for the concert. I have to say, her sound is great. Her voice is amazing, her band really strong, but on top of that her choice of songs are eclectic, Türkü, English and Turkish jazz, Blues, 60s rock, and Ottoman songs. Her whole set was dynamic due to her interesting set and her charming on stage personality. 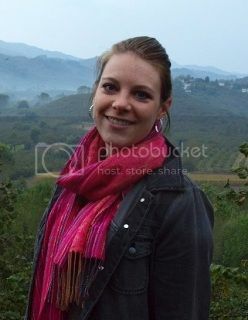 She was really endearing, not too polished, with semi-fluent Turkish with a strong Hatay accent (adorable)! This week we are going to Cer Modern for open air Turkish independent/art movies. They have English subtitles, which is great, because I haven’t really been able to watch any before now. We watched one last night and it was really fun! It was Şarkı Söyleyen Kadınlar, or the Singing Women, slightly depressing but really interesting. It was my first Turkish movie because usually they do not have English subtitles. We are going to another tomorrow. I can’t wait! Yesterday I went to the pazar. 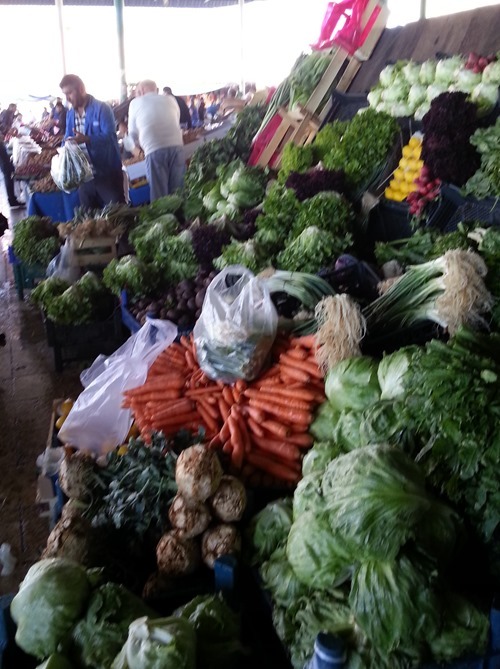 When I first moved here I went to the pazar almost every week. It was fun and exciting. It still is, but it is also a lot of work. I have to come home and wash and process it all. 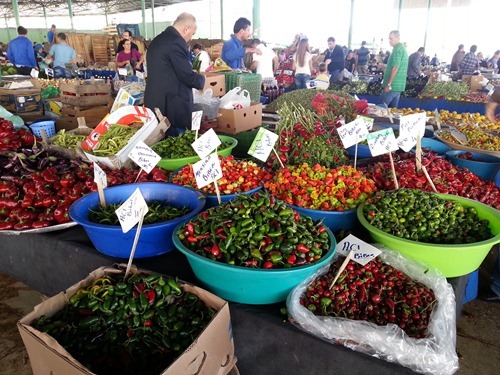 I also tend to buy more when I am at the pazar and it is hard to consume it all before it spoils. I am very careful to try to avoid wasting food. But yesterday I dragged myself out of the house and headed to the pazar. I was pleasantly surprised. 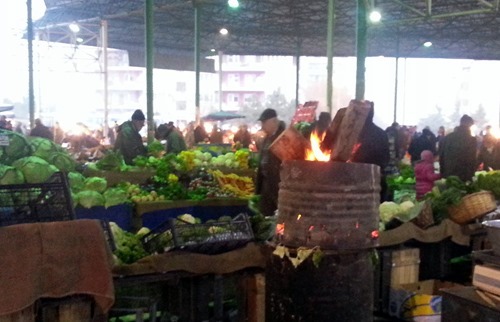 It was pretty cold yesterday, and scattered throughout the pazar were bonfires. Some in barrels, some not. In Ankara, in the winter the smell of black coal usually covers up all others. Coal is cheaper than gas, and is burned quite frequently in lower income areas. It creates a distinct smell and a dark haze in the valleys. Often times in the winter, when I go out I come back smelling like coal. It is not particularly pleasant. But last night I went to the pazar, and besides the normal sensory experiences the pazar usually offers, there was a new scent. Wood fires. Being from New Hampshire, I am well used to the smell of wood fires. Almost every family I knew, ours included, had a wood stove for winter hearing. I find the smell of burning wood aromatic and homey. The smell, plus the ambient light, made the pazar WICKED FUN! The pazar is definitely back on my list of fun excursions. We came back to Ankara the Saturday before school started. We had been away from the house for so long there was a lot to do, cleaning, food shopping, and getting ready for work the next day. Since we went vegetarian we pack our lunches, so we also had to do some food preparation. Due to the time constraints, it took a while to get back into the normal swing of things. But by last weekend we were back, and by that, I mean I was back at the pazar. I wanted to make some hot pepper jelly, and found a great hot pepper stand. I spent quite a while tasting this pepper and that pepper. I bought some really spicy green peppers and he gave me quite different kinds to try. Just as I was leaving I realized there was another type of pepper at the stand. I hit the jackpot! He had a couple of plastic tubs of fresh jalapeños! Normally you can only get jalapeños pickled, which do not have the full flavor of fresh. I immediately started picking out the best ones, and chatting with him about the peppers. The pazarci gave me some more peppers as gifts (probably five different types), and then a mandarin orange as he was concerned about how many hot peppers I had tasted. I told him about my plans to make hot pepper jelly and he was very interested. We talked some more and then I headed off to scour the pazar for the best figs for jam. 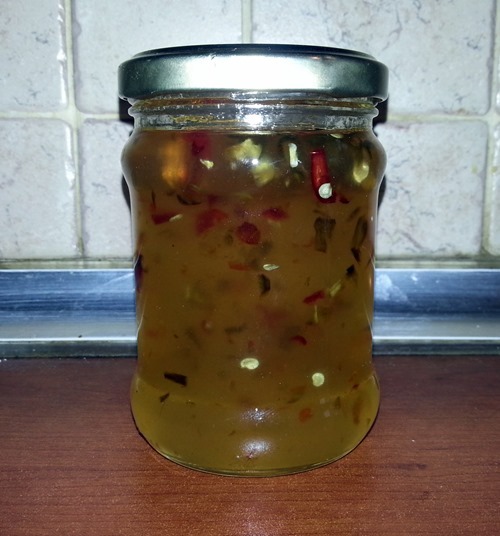 Yesterday I got around to making the jalapeño pepper jelly. I haven’t tasted it yet, but at least it jelled, so that is a step in the right direction. Yum! I can’t wait to try it with some labne. I left some seeds in so it actually should be pretty spicy. It only took two weeks for life to get back to “normal” in Ankara. I am glad we got there because our schedules are pretty packed for the next two weeks. Bülent’s sister is getting married this month. She is doing the nikah (legal marriage contract) with her friends and co-workers in Antalya next weekend, and the weekend after that is having the reception in Ankara. We are looking forward to celebrating both with her. Several times recently I have gotten lost on my way somewhere. I got the directions confused and ended up having no idea of where I was. I had two options, go with it or turn around go back and start stressing. In years past I would have done the latter, however, one of the things I am better at now is the former. In Turkey this is important. Sometimes when you are doing something, whether it is driving, paperwork, trying to get something done, there are obstacles. But getting tense about it will not help. TRUST ME! My husband likes to say the F-Word in Turkey is “Flexibility.” One has to be flexible to get stuff done. So when I was lost, I just kept driving. One of the great things about driving in Turkey is the road signs. Not the street signs, you could die of old age looking for a particular street. But the road signs are great, they are all over the place and direct you to different neighborhoods. Most people know how to get around then they are in a neighborhood, the hard part is getting there. In this sign the white signs are to neighborhoods, the blue to a different city. The blue sign will take you to a highway. Another thing about Turkey is there is no East/West North/South Highway nonsense. The highways are designated by the major city they go to. 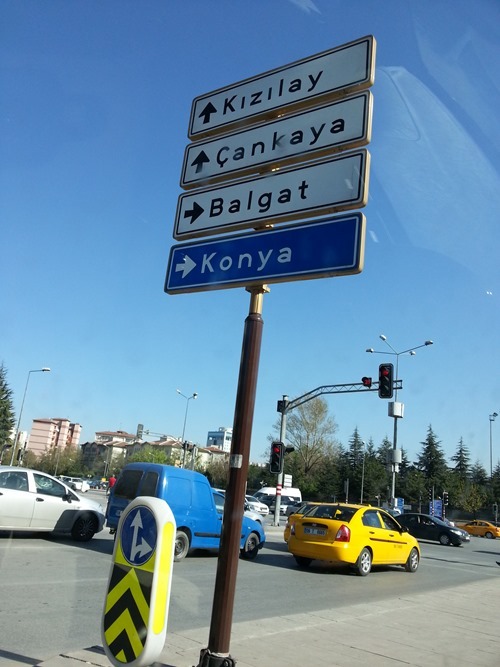 For example, for this highway, one direction is called Konya Road, the other Samsun Road. This is helpful for people (me) who get their directions mixed up. So when I get lost, I just keep driving and look for the road signs. The other day when I was completely lost, I ended up right where I wanted to be. Funny how that happens. The weather has been strange this winter in Ankara. It seems to go back and forth between cold and spring-like weather. Today, the sun is shining bright, the weather is lovely and it looks like the trees are budding. Not that I would know. I have been trapped inside with a nasty cold. I am planning to be fully recovered by tomorrow. I have been hacking and sniffling since Wednesday…Enough is enough! I am really excited for spring. 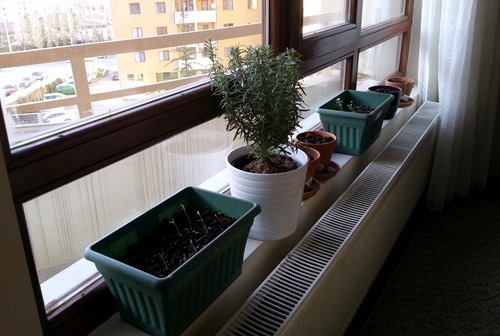 I can wait to get flowers for the window boxes on the balcony. 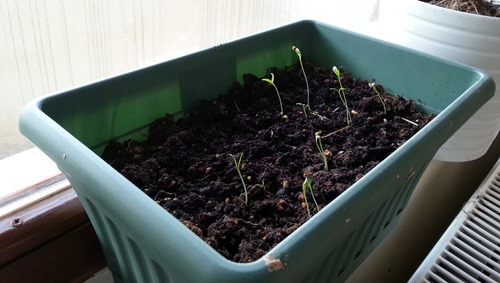 This year I also have some nasturtium seeds to plant to climb on the railings I have already started basil and thyme inside, as well as cilantro and mustard greens. I started some chives I started a few months ago, but I have to say, they have been really struggling. I am sure they will like going out on the balcony again and having some more sunlight. On the positive side—my tulip bulbs are blooming which makes the apartment seem nice and cheery! I do not have a green thumb, but am trying to practice, so when we have a yard it does not look like a barren wasteland! A commentary on girly stuff. Normally I do not write often about my issues with Turkey, or with feminine issues. However, living in Turkey, sometimes there are challenges. Especially with the girly stuff. What I mean by that, is that in many areas of life my husband can aid my cultural assimilation, but he really has no idea what the Turkish terms for some of the things I ask him, especially when they pertain to women’s health or beauty issues. I research things on my own, but sometimes the translation for beauty items is not direct. Some of the challenges pertaining to women’s products, is lack of variety. For menstruation products, they sell pads and OB tampons (without the applicator) ONLY. There are several brands and sizes of pads. There are several sizes of tampons as well, but OB seems to have cornered the Turkish market. I know this is a problem for some of my friends. Also, tampons are not sold in all grocery stores, which can definitely be a bummer. Though, they do sell condoms EVERYWHERE. I have very fine, fly away hair. I tried out a new product I had bought in the US. It is supposed to take care of flyaway hair and make it look smooth and sleek. Well—It does just that, all too well! This product was made of silicone and I could not seem to get it out of my hair. My hair looked lank and greasy even *right after* I washed it. Gross. Also I was limited to pony-tails, as otherwise I looked as if I had poor hygiene. I washed and washed my hair, but it did not improve. I looked it up online. I was supposed to use Clarifying Shampoo–whatever that was. Bülent did not know what it was, I asked some friends (in Turkish) and they were confused too. There was no direct translation. So I decided to do something I am know for—improvise. First: I used Dish Soap (Dawn)—I thought, well it cleans dishes right? No go! Just dry and dirty hair! Second: I used Dish Washer Detergent—because you know that stuff literally dissolved food left in pans. Didn’t work. Now I had a dry scalp and dirty hair. Then I tried an apple vinegar and lemon juice mix which was supposed to “clarify” hair. The result—the bathroom smelled like vinegar, Oh Yay! So then, I decided to bite the bullet and go to some super fancy hairdressers. I did buy some Kérastase Bain Clarifiant (Because Clarifying DOES translate more directly into French! Woot Woot!) So for 50 liras I got a bottle of fancy shampoo about twice the size of a travel bottle. Worth every penny. But if that hadn’t worked, my friend had given me some kitchen degreaser to try. We even tested if it would bleach my hair. I am SO glad I didn’t have to bust that out. 2) Don’t use products in your hair that contain ingredients used for heavy duty engine protection. 3) Dishwashing Detergent is not meant for hair. There is SO much snow here! 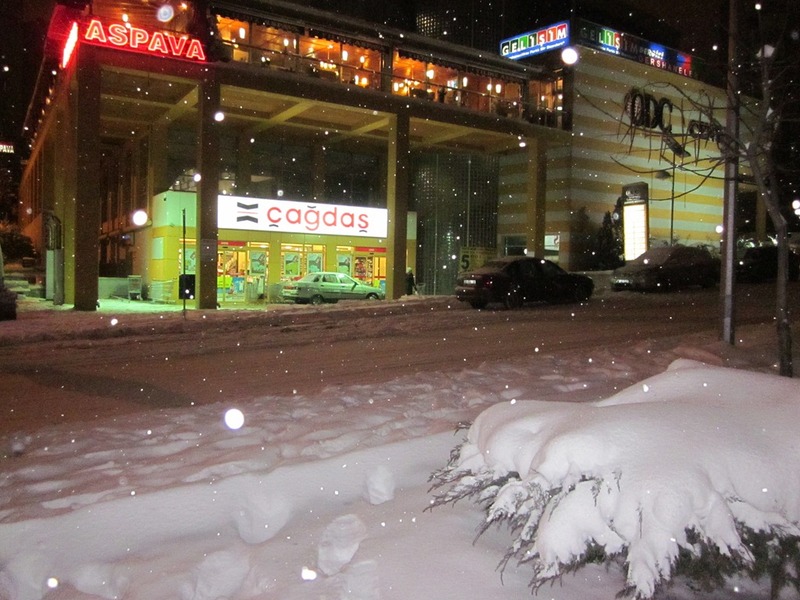 Ankara does get some snow, but usually not more than a couple inches at a times. Yesterday morning I woke up and there were a few inches of snow on the ground and it was snowing very hard. I thought “SNOW DAY!” But no such luck. We still had work. However, it was difficult to get home. The bus driver asked us to sit over the tires…not a good sign! There were plows out but there was just no way they could keep up with the volume of snow. A 15 minute drive took about one and a half hours. The major highway was like a skating rink. The travel was made slower by those poor souls who had to abandon their cars on the side of the road after they could not coax them any farther. I was honestly worried the bus would slide off the road several miles from our home. While the bus was supposed to take us within a couple blocks of our home, there was no way it could. To get home there was an uphill ramp and there were cars scattered all over it in all direction, like matchbox cars. So we were dropped off about 3/4 of a mile from our apartment. While we all had (dress) winter coats, coming from work we were not dressed for a trek through a blizzard-no hats or gloves. I was the only one with a scarf. We managed, and as we walked home through the dark neighborhoods we realized that the power must be out as well. Finally we got to our building and were very relieved. Not only were we home and safe, but our building has a generator… and it was working. Our building was the only one on the street with lights on. It has been snowing all night. It is still snowing. This morning they did cancel school.